Solar Panel, Battery & Inverter Repair, Replacement, Maintenance & Service- Halifax, Yorkshire, London & Rest Of The UK. Inverter technology that converts your solar power energy into use for your home or business is now more advanced and reliable. However, in the early years of the solar Feed In Tariff (FIT), many inverters only carried a 5 year warranty. As the tariff scheme ran itself down, many installing companies ceased to exist. This left Solar panel system owners with no one to turn to when inverters or any technical issues occurred. 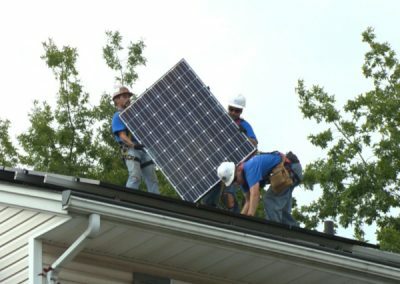 Many companies that are still in the industry appear to be reluctant to get involved in solar repair and solar maintenance of systems that they never originally installed. We provide the solution to this with a call out and annual maintenance check-up for clients whose solar systems may be over 5 years old. We also offer this service for our own clients as part of their installation package. This gives you piece of mind of knowing that safety checks on the original installation have been carried out, for insurance purposes and of course which in turn safe guards your Feed In Tariff payments and ultimately your investment. We provide a full service for Solar Panel Upgrades and replacement, battery installation and any maintenance and service checks that you might require. Solar Maintenance, Repair & Service From Panels to Inverter.